Most of us are aware of the ancient treasures of Egypt, but we might be a little hazy on what is where. It is a big country, after all, larger than Texas in square miles. Want all manner of things big and small and mummified, profoundly old? Then the Egyptian Museum in Cairo, the capital, is for you. Thinking more specifically of giant pyramids and the Sphinx? Then you should be looking at Giza, outside Cairo, to the west. Interested in enormous sitting figures that make humans look like insects? That is Abu Simbel, near Sudan, in the south of Egypt. If you crave massive temples replete with pillars and obelisks and hieroglyphics, then you want the two big tourist attractions of the former imperial city of Luxor: Karnak and the Temple of Luxor, which we saw today. As we went along, our guide kept up a running patter, as guides do, and he spent some time reading the hieroglyphics. Turns out, just about all the specifics we know about Egyptian history — and Egypt has as much history as anywhere — are thanks to a freakish discovery of a stele with three sorts of writing on it. That would be the Rosetta Stone. Before the Rosetta Stone, modern humans had no sure way to decode the messages the ancient Egyptians left for posterity, all those thousands of years ago. You have seen hieroglyphics, images of kings and foreigners and birds and lions and insects, etc. Interesting to examine, but without the Rosetta Stone they would be nothing more. The Stone enabled scholars, over the 19th century, to break the code of hieroglyphics, allowing experts to “read” them as you and I would read a newspaper. In the fourth century B.C., descendants of Macedonians/Greeks ruled Egypt from the Mediterranean city of Alexandria. They were named the Ptolemies, and they had some issues getting the Egyptian people to support them, being foreigners, and all. The government spoke what we now call “ancient Greek.” The people spoke Egyptian. 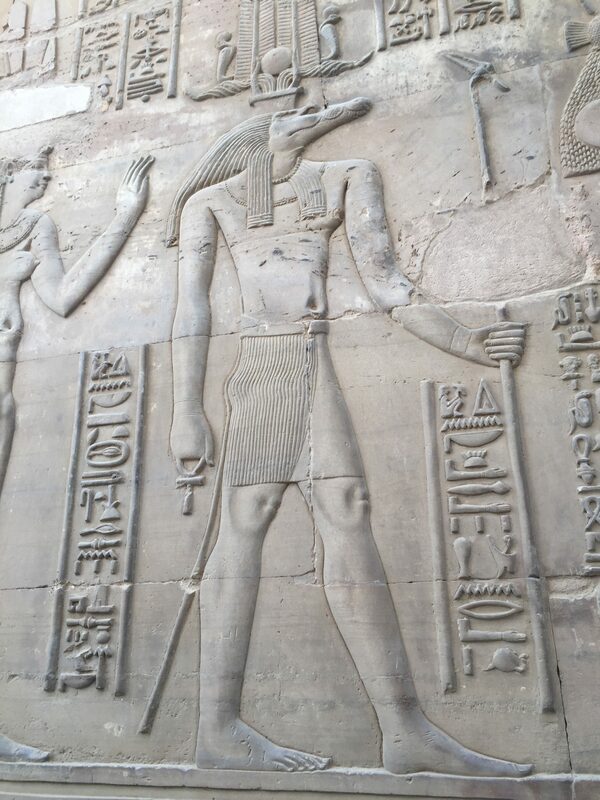 The priests and artisans understood the 900-or-so individual hieroglyphs that adorned so may official buildings or appeared on official communiques. The Ptolemaic Dynasty, realizing it needed to seem more native to Egypt, made concessions. One of them seems humdrum, all these years later — a decree that priests of the old Egyptian religion would not have to pay a certain tax. This was a time of flux, in Egypt, so the dissemination of the news came via inscriptions on rock. In at least one case, the decree was written out three times, etched on a flat stone. That was what was discovered by a French soldier, outside the town of Rashid (Rosetta) in 1799. He quickly got officers involved, who consulted experts with the French army, which had mounted an expedition in Egypt under the command of Napoleon. They soon realized that three separate forms of writing had been put on the stone. 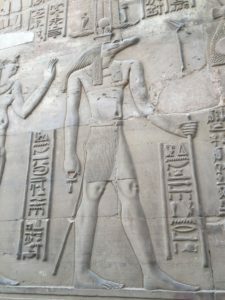 The upper third was almost entirely hieroglyphics; the middle third was something called “demotic” script and the bottom third was ancient Greek. All three on one slab of rock. Smart guys, circa 1800, soon had a suspicion that the three forms of writing were communicating the same message. Turns out, the middle bit, the demotic, provided links to the other two. The hieroglyphics had some demotic writing on them, and the researchers figured out that might well stand for concepts unknown to the priests — probably foreign phrases for which no hieroglyphs existed. Scholars who would understand ancient Greek, translated the bottom third. Soon, they realized there were patterns where Greek names fit into the demotic, which gave insight to the hieroglyphs, and eventually the whole of it was readable, and then all the prodigious output of ancient Egypt’s scribes was available to moderns. Families were identified, records were opened, dates of births and deaths of royals noted, Egyptian religion explained. Well, then. Now we know the scribes were doing their job, and their reports and statistics have become clear as day to modern scholars. I would have been impressed by Karnac’s grandeur and the Luxor Temple’s mighty columns, even if the Rosetta Stone never existed. But to understand the stories told by the ancients … made it even better.